How to Travel Light for your Next Holiday and save money too! With all the restrictions on how much carry on we can take with us when we go on holiday, and how nowadays in this era of cheap airfares we feel as the airline is taking the Mickey out of us when they want to charge us more money to take a suitcase along with us on holiday. We decided to have a look into traveling light, and how you can save money on all those ridiculous add-on charges. If you also book an all inclusive holiday, you’ll be surprised at just how little you can spend on a holiday! 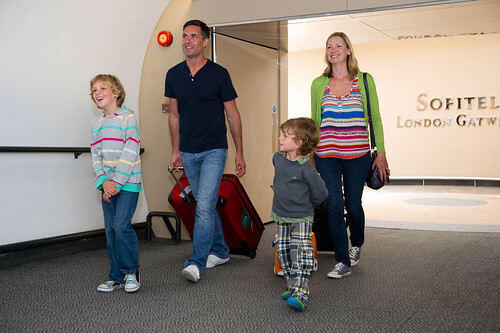 A family leaving London Gatwick bound for a great holiday adventure! The very first thing to do when flying on a low-cost airline is to have the correct bag to fit in the little metal box at the gate. We have all seen the people at the departure gate trying to squeeze a bag, that is obviously too big bag into that tiny little metal cage, while everyone else is looking up to the ceiling saying to themselves ”I hope they don’t want to check my bag”. Low-cost carriers such as Ryanair almost always have their staff check baggage that looks like it might be bigger than their 55cm x 40cm x 20 cm allowances. If you are looking for something that you do not care will last then go to your local discount store armed with a tape measure in hand, and see if you can find something suitable. We prefer a hard-cased shell as opposed to nylon due to the fact nylon bags can lose their shape and not fit into the holder, but if you prefer a backpack to a conventional case the Cabin Max Backpack fits the bill, available at Amazon for £24.95. Ryanair also sell their own carryon bag made by Samsonite for 99€ with free delivery. Only available from their website Ryanair.com which they guarantee will always be allowed on any of their flights. You also want to make sure that booking everything including your suitcase is done online, as once at the airport those hidden fees come out to bite you. For example checking a suitcase online will cost you 15€ if you try and do it at the airport the fee jumps to 60€. With the weight restrictions for most airline carry-ons being around 10 kg the trick here is to wear a jacket or vest that has loads of pockets to carry all your heavy gear. A company in America makes a jacket designed especially for travellers that has 20 pockets that can store everything from your phone to your laptop, along with a full range of clothing with the traveller in mind like a pair of cargo pants that have pockets on the legs that you can unzip, and turn into a pair of shorts. With this world of consumer disposables there is no need to take too much with you especially if you are heading to a beach resort, just buy a pair of flip flops, and a few t-shirts at the resort along with a toothbrush and toothpaste, and throw them away when you are done. If you are traveling for a city break some of the same things apply but have a look into some of the new high tech clothing that is available including clothes that you can hand wash in a sink that will dry in minutes, and lightweight water proof jackets. They even have underwear now that was first developed for professional athletes, but is available to the savvy traveller in a range of styles at Exoffico’s website. We hope this short guide will help you in packing light for your next holiday. Remember packing light makes sense and saves money! Image Credits: Holidayextras and curimedia.